During a recent Search Engine Optimization (SEO) webinar hosted by HubSpot, a mention of “inbound marketing” piqued my interest. Inbound marketing: that idea of bringing your consumer to you, not shouting your message at your consumer. I already knew that UM-Flint’s search engine results would increase with an elevated reach of our content. For example, if the content on our News Site, our departments’ blogs, and our forthcoming e-magazine (you’ll hear more about our e-magazine in the coming months) could become points of reference or interest, our ranking on Google and other search engines would rise. But how do we get there? How can the University of Michigan-Flint generate and disseminate content in such a way that our articles are linked to and shared? How can we leverage social media and other new avenues to lead traffic to our website? 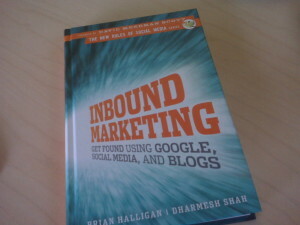 Cofounders of HubSpot, Brian Halligan and Dharmesh Shah have published “Inbound Marketing: Get Found Using Google, Social Media, and Blogs.” I literally walked out of that aforementioned SEO webinar, sat down at my desk, and ordered this book. What better way to learn how to achieve inbound marketing than to go to the source, right? Here, what I took away from this book and, more importantly, how we can use it at UM-Flint. Traditional marketing methods like direct mail, telemarketing, radio ads, emails blasts, and other “outbound” techniques are considered interruptions by today’s consumers. Interruptions are never appreciated and are easily ignored. To effectively communicate with our audience, we must lead people to our message. After all, no one is relying on those old-school “interruptions” to provide the information they seek. Instead, search engines, social media, and blogs are serving as sources of referral. Websites can no longer be a one-way conversation, with a message spewed at a user with the hope that it will be received. Our web presence should be interactive. Our content and message should reach far beyond our website and drive traffic back to us. In fact, by using avenues like social media and blogs, we can create connections with our audience and be a part of their conversations about us. Our website should be a collaborative “hub,” not an online version of a brochure. To increase our chances of being found by our audience, we must be “remarkable.” Halligan and Shah explain that a product or service must be worth talking about (or “remark”-ing about), and has to be the best in its arena. A notable bit of advice: “Watch your competitors, but don’t follow them.” Remarkable content will get linked by other sites, which will create traffic and increase our search engine results. Remarkable content is more likely to be spread via social media, achieving a broader reach. We must create content. Lots of it. Preferably, a variety of quickly-generated content that can be spread. The more places our content can be found, the larger our potential audience will be. Blog articles (which can include the articles on the UM-Flint News Site), short videos, photos, and webcasts are perfect content for us to create and share. The majority of all searches are conducted on search engines, such as Google. Halligan and Shah provide very useful tips for Search Engine Optimization that are worth reading if you are interested in the topic. For the sake of brevity, I will not outline these here. Put simply, to ensure that we are ranked highly in search results (as high in the list of results as possible), we need to: 1) Increase the relevance of our pages by accurately titling pages and writing appropriate content. To do this, we must identify and utilize the best keywords for our pages, blog posts, and news articles. 2) Increase the authority of our pages by increasing the number of links to them. The more sites reference us in relation to a keyword, the greater our Google-assigned authority will be for that keyword. Social media sites provide a reach that your website alone cannot. With so many people spending their time on social media websites, we simply must be present there. An in-depth overview of applications like Facebook, LinkedIn, Twitter, YouTube, and more can be found in “Inbound Marketing,” including advice for getting started with each. A common theme across platforms, however, is the need for generating that “remarkable” content that will be shared. Shared content equals a greater reach. To find out how remarkable our content is, we should track the number of web sites that link to our content, how many social bookmarks we’ve achieved, and how many of our site’s pages are indexed by Google. One resource offered by Halligan and Shah is website.grader.com. Tracking the results of SEO is crucial. Which keywords are getting people to our website? What percentage of our visitors come to you from a search engine? Which of our website’s pages get the most traffic, and why? The answers to these questions should shape our SEO strategies. Halligan and Shah suggest tracking progress in social media by looking at the number of Facebook “fans,” followers on Twitter, or views on YouTube. More in-depth analytics are available by way of Facebook Insights or websites like Twitter Grader. I also recommend tracking your Twitter progress with Klout. Halligan and Shah do more than explain the concept of inbound marketing and provide suggestions for getting started. They also provide great information about converting website visitors into valuable leads and eventually customers. There are tips for creating a power-packed inbound marketing staff or working with a PR agency. I am personally excited about the resources and “tips from the trenches” included in the back of the book. If you are at all interested in learning more about inbound marketing, the basics of SEO, or how to use your website, blog, or social networks to your advantage, I recommend reading this book in its entirety.